Have you shared your ideas on the BC Developer's Exchange yet? If you haven't heard of the BC Developer's Exchange, it's an new idea being tested out by the Province of BC to work closely with local tech communities across BC to discover new ways to seed business opportunities for the province’s tech sector. It includes sharing government code, data and APIs, and adopting innovations from the tech industry back into government. Think GitHub and Stack Exchange methodology meets public sector! To help start up this exchange, we held an OpenDataBC BCDev event in Vancouver at the Hive in April where over 100 local Vancouver came out and provided their ideas on what's needed to make this Developer's Exchange work. Among the panel that started the discussion, was Mischa Steiner-Jovic, founder and CEO of Awesense and Adam LaFrance, co-founder & CEO of Knomos, who shared their insight as startups using public sector data. The new BC Developer's Exchange and Province of BC GitHub accounts, and the opportunities the Github methodology offers for public sector resources generated a considerable amount of interest, with many participants agreeing that the BC Developer's Exchange GitHub is a good place to provide input. Events were also held by Accelerate Okanagan, BCTIA, and Viatech at Forttectoria.ca. The new Code for Canada (Vancouver) - inspired by Code for America's Code for All movement - is also hosting an opportunity to provide input on the BC Developer's Exchange on June 4 (which we'll be livestreaming). 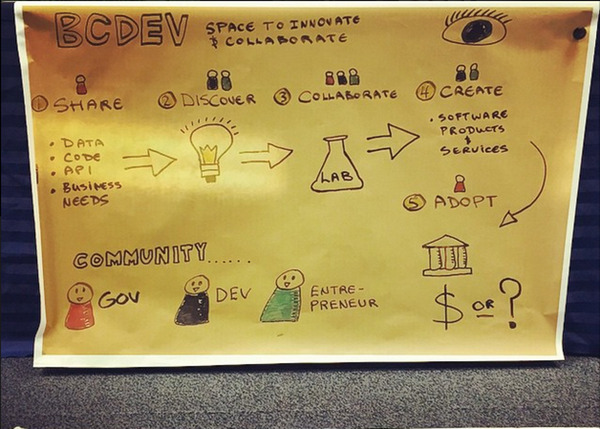 But these BCDev Exchange events are not the only way to share your input on this idea! Are you aware of available public sector digital resources? What has your experience been like? What do you see as the opportunities, challenges and barriers to access? What do you think are the public sector digital resources with the greatest commercial value? What has your experience been in commercializing products and services that used public sector digital resources? The BC Developer’s Exchange is focused on both expanding the availability of public sector digital resources and creating more opportunities for tech entrepreneurs to sell innovative products and services back to the public sector. What do you think needs to be in place to make this work? So go ahead, choose a platform that works for you, and share your ideas! We're looking forward to hearing what our open data community has to say.